Since the banning of DDT in 1972, the Chesapeake Bay osprey (Pandion haliaetus) population has recovered remarkably. However, spatial variation in the population growth rate was revealed by a Bay-wide survey conducted in 1995 and 1996. Generally, the highest rates had occurred in the upper estuarine areas while the slowest rates had occurred in the lower estuarine areas. Indications of food stress have been previously documented along the Bay proper, and reduced reproductive success has been recently anecdotally observed in the same locale. To what extent food availability might be influencing population dynamics on a broad scale in the Bay, though, is currently unknown. We hypothesized that the spatial variation in the population growth rate of ospreys in Chesapeake Bay reflected, in large part, differences in reproductive success mediated through provisioning rate. 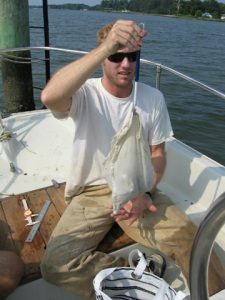 To address this, we assessed reproductive success, diet composition, and provisioning rates in both upper and lower estuarine sites in lower Chesapeake Bay during the 2006 and 2007 breeding seasons. In addition to commonly measured reproductive parameters, we characterized reproductive success by calculating nestling growth rates. Diet composition and provisioning rates were determined by installing micro-video monitors at selected nests. Our results were analyzed using a linear mixed-effects model that incorporated random effects terms. We found significant differences in osprey diet composition between salinity zones. Atlantic menhaden (Brevoortia tyrannus) and spotted seatrout (Cynoscion spp.) dominated the diet in the lower estuarine sites, while gizzard shad (Dorosoma cepedianum) and catfish (Ictaluridae) dominated the diet in the upper estuarine sites. Temporal comparisons indicated that the contribution of Atlantic menhaden to diet composition in the lower estuary has decreased markedly during the past two decades. We also found significant differences in osprey productivity, nestling growth rates, and provisioning rates between salinity zones. All parameters were highest in the upper estuarine sites. More importantly, these parameters were positively correlated, and differences in productivity were primarily due to the extent of brood reduction. Our data therefore indicate that broad scale food availability and its subsequent impact on reproductive success is contributing to spatial variation in the growth rate of the Chesapeake Bay osprey population. Given the availability of nesting substrate in the lower estuary, these findings are particularly interesting in light of the emphasis that has historically been placed on nesting substrate as perhaps the primary natural limiting factor for osprey populations. Obviously, the cause(s) for reduced food availability along the Bay proper has important implications. Food resources may simply becoming naturally restricted through density dependent feedback mechanisms. Though, an arguably much more plausible explanation is the overharvesting of preferred prey such as Atlantic menhaden. Thus, ospreys may once again be serving as a valuable bioindicator of ecosystem health in Chesapeake Bay.